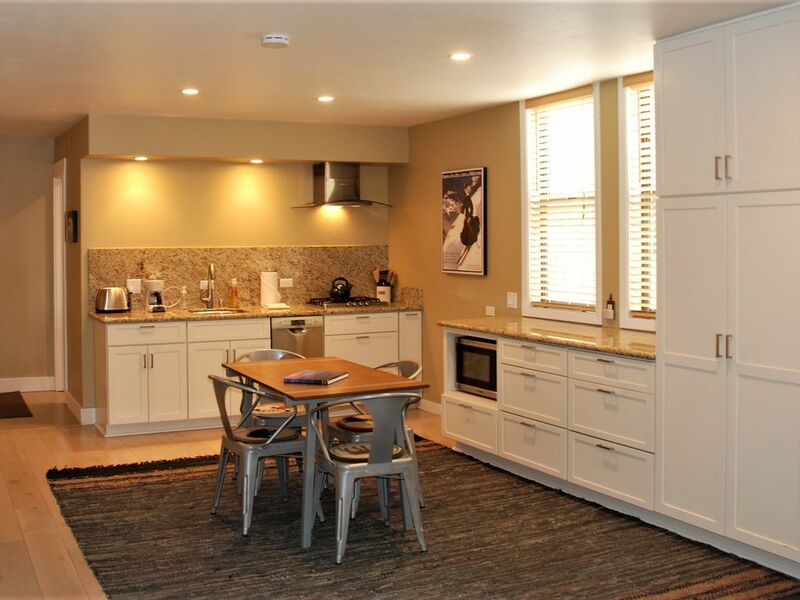 Newly remodeled studio condo in Aspen Grove, walking distance to the Village or use Northstar's free shuttle service. Sleeps 4, with 1 queen murphy bed and 2 twin murphy beds. Ideal for a family with 1 or 2 children. Includes access to the Northstar Recreation Center including a full gym, heated lap pool, arcade, tennis courts and hot tubs. Only 10 minutes to downtown Truckee and only 15 minutes to Lake Tahoe. No smoking unit. No pets (daughter is allergic). Oven is not full size but accommodates most needs. What a lovely stay -only wish it was longer! This apartment is fully remodeled and so cute. Loved being able to catch a shuttle or walk to the village -no driving/no car needed. Definitely look to stay here again. Loved the location. Design and layout of the unit was very unique and functional with 2 kids. Chris was informative and responsive. The kids had lots of fun. Thanks! Beautiful unit. Everything is well thought out. Super comfortable beds, immaculately clean. Right in front of shuttle, one stop away from the Village. Very nice host. Great place. Very functional and nicely decorated. Very close to the village, 5 min walk. Very nice place. Nicely remodeled and very functional for a family with the kids. My wife loved the art on the wall- nice touch. Close to the village with only 5 min walk through the woods. I really enjoyed my morning walk to the slopes. Shuttles available to take you to the village or rev area but timing can be occasionally tricky. Overall, we had a really good time. We really enjoyed our recent stay at this nicely remodeled condo. It's cozy and spacious for the 3 of us, within walking distance and also has shuttle access to the Northstar ski area. The beds are really comfortable. Chris (the owner) is very responsive to our questions and very accommodating. Overall we had a great time and will definitely come back! No pets (daughter is allergic). No refunds due to weather. Full refund if cancelled 30 days prior to check in, 50% refund if cancelled between 14 and 30 days prior to check in, no refund within 14 days. $400 deposit and $90 cleaning fee required at time of booking. Deposit will be credited back within 7 days. Check in after 3pm, check out before 11am.